If you've been reading my blog for a while you'll probably know that I wrote a blog post about how Zoe a.k.a. Zoella was one of my style icon's and I'm back with a new one. I'm going to be talking about Lucy Hale and how she is one of my style icons. Let's get into it. My first outfit of Lucy Hale's that I'm obsessed with is this one that Lucy wore to opening of New York retailer Henri Bendel at the Fashion Show Mall in Las Vegas. She wore a Topshop insert peplum top and a Free People skater skirt. I love this outfit. I think that the pieces of clothing really compliment each other. What I absolutely love about this outfit is the lace sleeves and this actually gave me the inspiration to by a black lace dress with lace sleeves. The second outfit of Lucy's that I really love which I wish that I would be confident enough to wear is the outfit she wore to perform her song. She wore an aztec print skirt from Topshop and a ribbed black crop top which she paired with some long silver chains. I think this outfit just looks effortless, much like all of Lucy's outfits. She just looks gorgeous in it. Okay, so at first when I saw this outfit I thought it was what Lucy's character from Pretty Little Liars, Aria, wore. However, when I saw that her name necklace does in fact say Lucy I was like she doesn't even get into costume for PLL she just shows up. 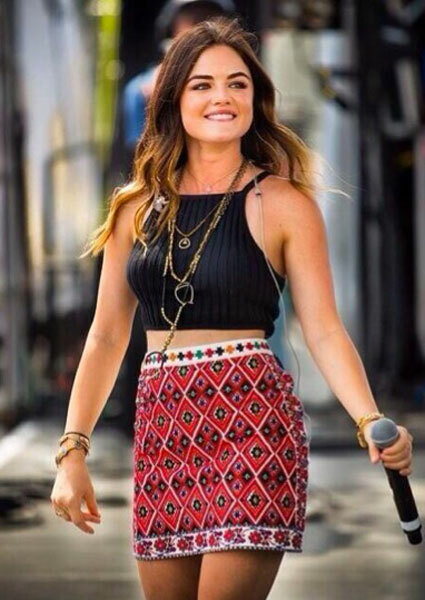 Lucy wore this outfit also performing her song at the Hollister House in California. Not only does her burgundy dress with flowers on it, her chunky brown belt and accessories make me love the outfit, it's her hair. It's very boho with the different coloured streaks running through it tied into a loose, wavy braid really brings the whole outfit together and I just love it. Can I please be Lucy Hale? Seeing as this blog post does eventually have to come to an end, even though I could go on forever, my last outfit of Lucy's I want to share with you is one that she wore to one of the Pretty Little Liars screenings. Literally look how perfect this dress is. I think it just looks so boho, from the dress to the necklace to her hair and then the shoes just add that bit of dressiness to the whole outfit. I think my love of lace sleeves has come from Lucy Hale to be honest. I think that even though the shark tooth necklace isn't a really bright colour it just adds the right pop of colour and pulls the whole outfit together. Also, I seriously need to grow my hair long enough and get the perfect Lucy Hale inspired messy braid.